Teton Dam Failure Case History – A case history of dam construction, investigation, or failure of interest to the membership. Association of Dam Safety Officials is a national non-profit organization of state and federal dam safety regulators, dam owners and operators, engineering consultants, manufacturers and suppliers, academia, contractors and others interested in dams safety. Links to state organizations and contacts are provided. California Division of Safety of Dams is one of the largest state dam safety regulatory agencies. Federal Energy Regulatory Commission is the federal agency charged with the safety of dams used in hydroelectric power facilities. Includes a link to the regulations, guidelines, and manuals published by FERC. International Commission on Large Dams is an organization which promotes advances in the art and science of water resources through dams and to develop them in a technically safe, ecologically and socio-economically sustainable manner. United States Society on Dams is an organization of professionals dedicated to advancing the role of dams for the benefit of society. U.S. Bureau of Reclamation's Engineering Geology Field Manual is a comprehensive guide to site and materials characterizations for the purpose of dam engineering. U.S. Army Corps of Engineers Civil Works Engineering Manuals is a series of technical manuals published by the U.S. Army Corps of Engineers that includes many of interest to the engineering geologist. California Department of Water Resources Division of Safety of Dams offers a series of technical references published by staff that including papers on seismic hazards and dam foundations. Natural Resources Conservation Service Handbooks, Manuals, Technical Notes and Technical Releases is a series of technical manuals on all aspects of NRCS work, including dams and engineering geology. Dam-related research of J. David Rogers is a collection of paper and PowerPoint presentations on dam construction history and dam failures. Environmental & Engineering Geoscience, 2010, Greene, B.H. (editor), Special Issue on Dams, Vol. XVI, No. 3. 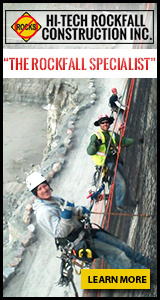 AEG members may click HERE to access GeoScience World. Bruce, Donald A., 2012, Dams & Hydraulic Engineering, Specialty Construction Techniques for Dam and Levee Remediation, CRC Press, 447 p.
Best, E., 1984, Dams, Engineering Geology: in Finkl, C. W., (ed. ), The Encyclopedia of Applied Geology, Van Nostrand Reinhold Company, (New York, New York), 644 p.
Burwell, E.B., and Moneymaker, B.C., 1950, Geology in Dam Construction: in Paige, S., (ed. ), Applications of Geology to Engineering Practice, Berkey Volume, Geological Society of America, New York, 327 p.
Goodman, R.E., 1993, Engineering Geology-Rock in Engineering Construction: John Wiley & Sons, Inc., (New York, New York), 412 p.
Jansen, R.B., 1983, Dams and Public Safety: U. S. Bureau of Reclamation, Water Resources Technical Publication, (Denver, Colorado), 332 p.
Jansen, R.B., (ed. ), 1988, Advanced Dam Engineering for Design, Construction, and Rehabilitation: Van Nostrand Reinhold, (New York, New York), 811 p.
Krynine, D.P., and Judd, W.R., 1957, Principles of Engineering Geology and Geotechnics: McGraw-Hill Book Company, (New York, New York), 730 p.
Legget, R.F., 1962, Geology and Engineering: McGraw-Hill Book Company, (New York, New York), 884 p.
United States Department of Interior, Bureau of Reclamation, Design of Small Dams, A Water Resources Technical Publication, Third Edition, 1987, U.S. Government Printing Office, (Washington, DC), 860 p.
Weaver, K.D., and Bruce, D.A., 2007, Dam Foundation Grouting, ASCE Press, 506 p.